Season and Grill your ribeye as you prefer, I prefer mine medium rare with a little salt and pepper. Mix olive oil and balsamic vinegar in a small glass bowl until it is emulsified. 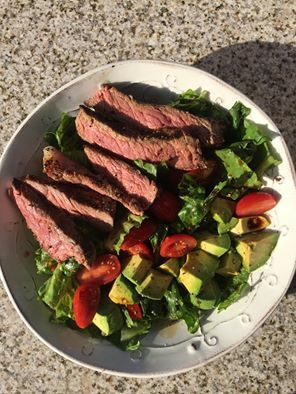 Toss greens, avocado and tomatoes with vinaigrette, cut steak as desired and place on salad. Enjoy!